Unity is great in terms of the ease to create graphics applications, the wide compatibility with different platforms (thanks to Mono), and its pioneering role in the current fast growing AR/VR market. However, most programmers are more comfortable with C++, and Linux, than C# and Windows. As a result, many existing great libraries, especially in the field of computer vision, are C++ projects. Examples include OpenCV, ARToolKit, etc. find a way to interface native libraries. I went for the second option, and here comes HoloLensARToolKit. I hope this wiki page will make your life easier when you are faced with this question. The CLR provides additional services including memory management, type safety, exception handling, garbage collection, security and thread management. Great! C++ code can be built with CLR as well, as the name “Common Language Runtime” suggests. Therefore, one good way to go is to build your native code using CLR, put your library in Unity asset path, and use it as if it is written in C#. However, it is not quite intuitive to migrate those huge and useful native libraries (OpenCV, ARToolKit) to CLR. If you just hit “build” to build them, the library files that appear in your project folder are unmanaged libraries. Some additional work has to be done in order to correctly and safely interface managed and unmanaged libraries: Marshaling and PInvoke. Let us look at the native C++ code first. What is the desired running platform? What are the functions that you want to call in C# managed code? If we take Win32 as example, then the native library should be compatible with Win32. Because the built dll file is shipped with your Unity application to the desired platform, all the dependencies of your library should exist on the target platform. In the case of HoloLensARToolKit, the library ARToolKitUWP.dll should depend only on UWP and WINRT system libraries, instead of general Win32 libraries (e.g. kernel32.dll). A useful tool is called Dependency Walker that can help you to check the dependecies of a dynamic link library. Basically, in order to successfully link the native library on the target platform, these dependencies must be satisfied on the given device. If your library depends on other third-party libraries, then these third-party libraries should be compatible with the specific platform as well, and make sure they are placed in the searching directory of runtime linker. If you are not sure about the directories, just place them at the same location as the .exe or .dll files. Not all functions in a library can be called by the outside, apparently. It is left to the programmer to design an accessible interface exposed to other libraries. 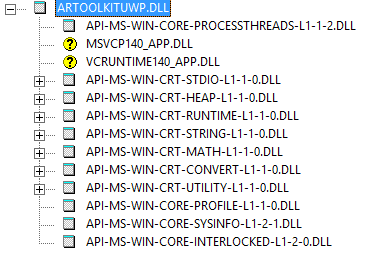 The files ARToolKitUWP.h and ARToolKitUWP.cpp define such interface for HoloLensARToolKit project. A good practice is to design a singleton class representing a controller, so that all the public functions of the singleton object could be called externally, and the native library manages one single object. In the case of ARToolKit, the ARController class is designed like this, since there is only need for one controller in general. ARToolKitUWP.h defines the full list of exportable functions for HoloLensARToolKit project. Once such function definitions are made and the functions are found in the native library, they can be directly called in C# code. This technology is called PInvoke. In HoloLensARToolKit project, the native function entries are defined in ARToolKitUWP-Unity/Scripts/ARUWPNative.cs, for your reference. In computer science, marshalling or marshaling is the process of transforming the memory representation of an object to a data format suitable for storage or transmission, and it is typically used when data must be moved between different parts of a computer program or from one program to another. In the case of C# interfacing native code, the data exchange between managed environment and unmanaged environment only happens at the time when native functions are called and returned. The processing by native code happens in between, but the computation does not affect the managed memory. Therefore, we only need to perform such memory transformation when native functions are called and returned. Marshaling does the trick. The bool type of C++ is marshaled to the bool type of C#, and the char buffer set by native function is returned as StringBuilder object of C#, because of the different representation of data types for both languages. Marshaling is not only about data type conversion, but also creates manageable memory for unmanaged data, so that the data can be later managed by CLR, e.g. garbage collection. HoloLens is fascinating in terms of holographic display and in-room localization, but the capability of the front-facing camera (locatable camera) is not fully utilized for potential augmented reality applications. Universal Windows has a whole different set of tools and run-time libraries. The dependencies of existing ARToolKit does not exist on UWP, such as pthreads, video libraries, opencv. 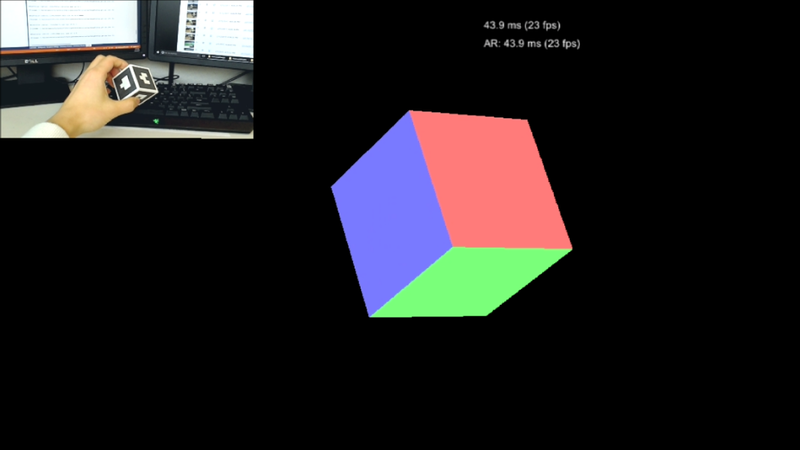 Luckily, after spending some time on this, I successfully get some pieces of code written, and actually make ARToolKit runs on HoloLens. The repository is called HoloLensARToolKit on Github. 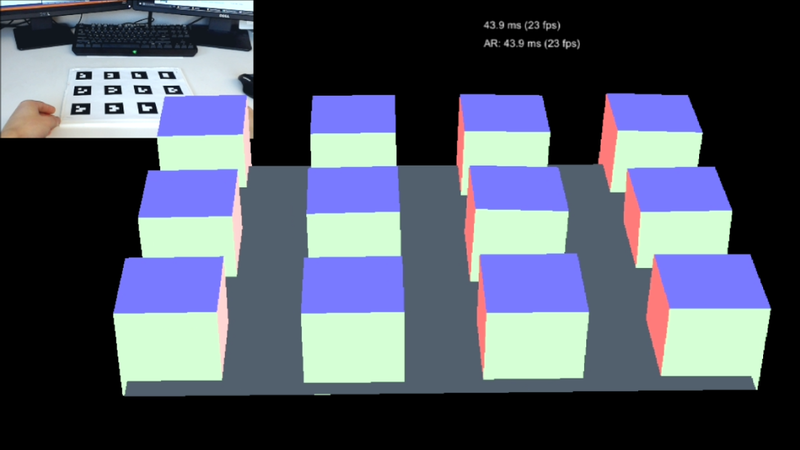 The following videos and screenshots are taken with HoloLensARToolKit v0.1. 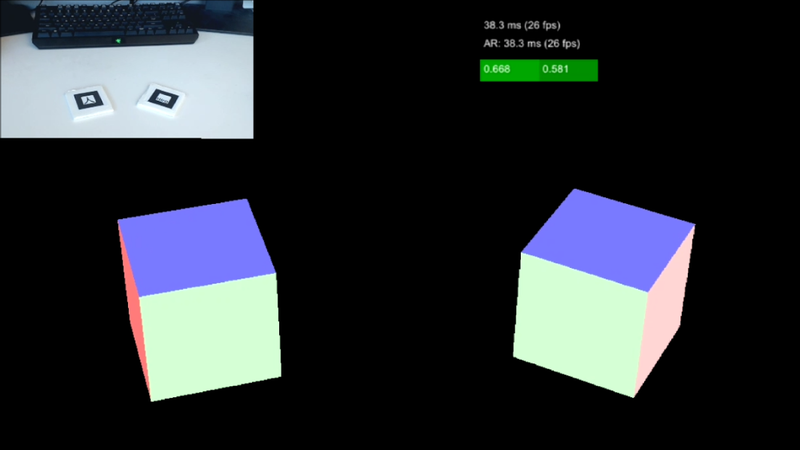 There are three samples of HoloLensARToolKit, each representing a certain kind of marker that is supported: single marker, cube marker and multi marker. This video is taken on HoloLens Device Portal, also known as Mixed Reality Capture. You might have noticed that there is still some lag between the video that is captured and update in the rendering. With ARToolKit integrated with HoloLens, many more augmented reality applications are possible. If you are AR/VR developer, you must see what I mean here.